How tableside ordering can help your restaurant? If you’re interested in really amping up engagement and improving the experiences of your guests, look no further than tableside ordering. When discussing tableside ordering, we’re really talking about two options. The first involves placing a tablet solution in a stand on each table. Guests can use the tablet to place orders, re-order drinks, call the wait staff for assistance, and more. The second implementation option is arming your wait staff with tablets that they can use to take orders at the table. In both cases, the benefits are significant. Increased speed — orders placed tableside are immediately sent to the kitchen and bar for preparation. Reports show table turns can be increased 10% to 20%. Increased efficiency — placing the order on a tablet reduces the chances of making mistakes between the server and the POS station where orders are entered. 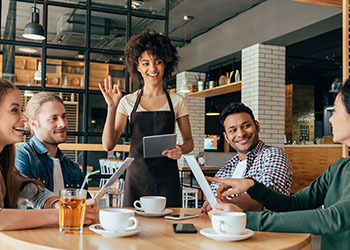 Improved customer service — wait staff can spend more time with customers, ensuring a high level of service and satisfaction. Increase in average ticket — for tablets at each table, there are some reports that such self-service kiosks show a 20% higher average ticket by giving customers the ability to browse at their own pace rather than feel rushed to order. Probably the biggest deterrent to tableside POS investment is the cost, especially if you go the route of placing a tablet at each table. However, the tangible ROI of the above “pros” means that such an investment will pay for itself quickly. Introducing tablets to customers or your wait staff isn’t something to rush. There are a few important things to consider. Usability — If customers are going to order on their own, the user experience and interface must be simple to use and easy to navigate. If wait staff are going to use the tablets, they should be properly trained. Tablet selection and accessories — Tablets don’t necessarily need to be purpose-built for a restaurant; iPads and Android tablets will suffice. However, you should consider enclosures and other protective cases to protect the devices. If your wait staff is going to use the tablets, make sure you have adequate space for charging the devices. Tablets at the table will require a constant source of power. Wi-Fi — Tablets require a strong wireless network to work correctly throughout a restaurant. Don’t trust your entire ordering system to a consumer-grade router. Work with a trusted IT reseller who can perform site surveys to test your building for wireless dead spots and install highly secure enterprise-grade wireless access points. As a bonus, your wireless network can be segmented for guest Wi-Fi to improve customer experience further. As restaurants seek to improve customer experiences and become more efficient, tableside ordering will become more common. All evidence points to a proven model with exciting upside. Ask your current POS software provider if they have tablet software to enable you to test tableside ordering with your guests.